Foodservice equipment (FSE) is the equipment used for handling or processing food, right from peeling to grinding, cooling to roasting, etc., for commercial purposes. Various types of foodservice equipment are used in the foodservice industry, such as food preparation equipment, drink preparations equipment, cooking equipment, heating and holding equipment, refrigerators, and chillers. The global foodservice equipment market is anticipated to witness significant revenue growth over the forecast period. Rapid changes in lifestyles have led to a shift in consumer preference from full service restaurants to quick service restaurants. As a result, domestic and international companies are making major investments in quick service restaurants. The sales of foodservice equipment are expected to increase at a rapid pace, owing to the high expenditure on food and related items. However, the high cost price of foodservice equipment is a prime challenge for foodservice operators, as these account for a major share of the total capital cost for new foodservice outlets. Foodservice equipment needs to be tailored according to requirements and available space in food retail stores. This, in turn, significantly increases the costs associated with foodservice equipment. Full service restaurants are expected to dominate the foodservice equipment market over the forecast period. However, the rapidly growing number of quick service restaurants is creating high growth opportunities for the foodservice equipment market. Foodservice equipment manufacturers will be benefited from the food industry market scenario, as consumer awareness is increasing regarding the associated health problems due to high fat consumption. The explosion in popularity of low fat foods has forced food companies and manufacturers to expand their foodservice equipment product ranges to keep up with consumer demand, and also foodservice equipment suppliers to develop new technologies for food manufacturers. Restaurant owners are increasingly incorporating innovative foodservice equipment in order to cater to the ever-growing consumer demand. A new trend in the foodservice equipment market is the use of energy-efficient, advanced technology equipment in restaurant kitchens. One of the most popular trends in the foodservice industry today is grab-and-go or takeaway food. Consumers are increasingly preferring foodservice equipment to add convenience to cope with a fast-paced lifestyle. This alternative over conventional restaurants offers a higher and faster food accessibility level. A growing trend of takeaway food among consumers in developed as well as developing countries is foreseen to strengthen the foodservice equipment market in fast-casual restaurant settings. Serving the generation Z consumers is the new challenge for the foodservice equipment industry; using customised foodservice equipment is a growing trend in the foodservice equipment market. Moreover, free Wi-Fi, online food ordering facility, digital menu boards and tables, and many more technological additions are being incorporated in the foodservice equipment market. Dover Applying Different Strategies to Enhance Market Penetration in the U.S. In February 2015, AB Electrolux acquired Chinese-based dish washer manufacturing company Shanghai Veetsan Commercial Machinery Co. Ltd. In March 2016, Rational AG launched a new iPhone and iPad application that enables a remote control monitoring option for foodservice equipment located at its self-cooking centre. In February 2015, Middleby Corporation acquired Marsal & Sons, Inc. and Marel’s U.K.-based high speed slicing business unit. Also, in September 2015, the company acquired AG Arange Master Group plc, a manufacturer of residential foodservice equipment, including ranges, ovens, and refrigeration. Companies are focusing on technological advancements to meet with future customer requirement and to comply with global competence. Foodservice equipment such as grills, fryers, and ovens are being integrated with high-tech functionality to automate the entire process. Foodservice equipment companies are expanding existing facilities and also building new facilities in order to expand business and penetrate into new markets. Also, foodservice equipment companies are setting up showrooms in various countries to showcase their latest products and increase consumer awareness about foodservice equipment usage. Foodservice equipment manufacturers are focusing on offering highly customized products and expansion of their product portfolios in order to maintain a competitive advantage and experience sustainable growth. Companies are launching energy-efficient, compact, high-performance products in various applications ranging from household to commercial use. There is an attractive opportunity for foodservice equipment manufacturers in Asia Pacific, as food expenditure is rising at a rapid pace, with new opportunities in the region also increasing at a rapid pace. MEA, Latin America, and Eastern Europe will also offer attractive opportunities for market players in the foodservice equipment marketplace. There is a price variation between foodservice equipment offered by Chinese-based manufacturers and major international players. Chinese-based foodservice manufacturers have gained high traction in Asia Pacific, which is expected to be the next growth engine for the foodservice equipment market. As a differentiating strategy, major international foodservice equipment market players are focusing on offering innovative products equipped with high-tech functionalities. On the basis of foodservice equipment product, the X-Band foodservice equipment segment is expected to dominate the global foodservice equipment market during the forecast period. 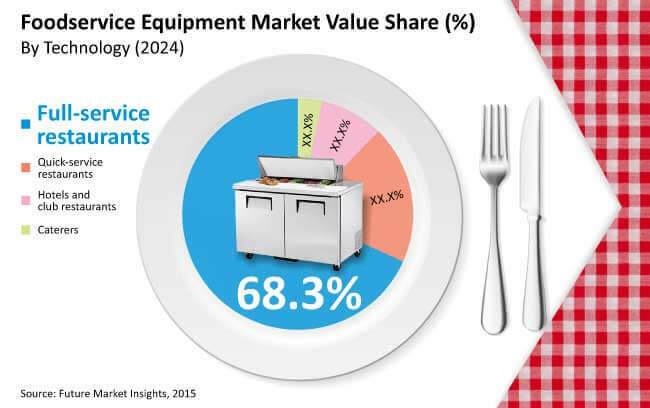 During this period, the X-Band foodservice equipment segment is projected to grow at a leading CAGR as compared to the other product type segments. By foodservice equipment application, the merchants segment is the dominating segment with respect to foodservice equipment sales value share. However, the military naval segment is also catching steam and growing at a fast pace. By foodservice equipment product type, the cooking equipment and baking equipment segments are expected to continue to gain the highest traction, followed by the dishwashers segment. Food manufacturers have introduced various types of low fat products, and buyers have displayed a positive response towards these products. The explosion in popularity of low-fat foods has forced food companies and manufacturers to expand their product ranges to keep up with the consumer demand for fat-free eatables, and also low fat stripping system suppliers to develop new technologies for food manufacturers. Foodservice equipment manufacturers are coming up with designs that also serve as a transfer conveyor during normal operations. Foodservice equipment manufacturers are looking towards huge markets by targeting food & beverage companies present in the low-fat products segment, as a significant share of the world’s population is putting on a lot of weight. Overall, the global foodservice equipment market is expected to grow at a CAGR of 5.2% in terms of value by the end of the forecast period. There has been a surge in foodservice equipment industry consolidation over the last five years. The ongoing foodservice equipment market consolidation is primarily attributed to the increasing demand for organizational efficiency, product innovation, and market expansion, especially in the developing regions of Asia Pacific and Latin America. Major foodservice equipment market participants involved in the production and sales of foodservice equipment include Electrolux, Libbey Inc., Tupperware Brands Corporation, Fujimak Corporation, Duke Manufacturing Co. Inc., Cambro Manufacturing Company, Inc., Vollrath Co., Hoshizaki Electric Co., Ltd., Dover Corporation, and Rational AG. However, the three most prominent players include Manitowoc Foodservice Inc, Middleby Corporation, and Ali S.p.A, Hobart Corporation. This FMI study offers an eight-year analysis and forecast of the global foodservice equipment market between 2016 and 2024. The study considers 2015 as the base year, with market values estimated for the year 2016, and a forecast developed for the duration of 2016 to 2024. Compound Average Growth Rate (CAGR) is represented from 2016 to 2024. The study covers various perspectives of the foodservice equipment market, including market dynamics, value chain, pricing analysis, competition analysis, regional and segmental growth comparison, and macro-economic and industry growth analysis, along with segment level projections in a comprehensive manner. As per the findings of the study and perspectives of industry participants, the global foodservice equipment market is projected to grow at a CAGR of 5.2% between 2016 and 2024 in terms of value. The report starts with a market overview, and provides market definitions and analysis about drivers, restraints, and key trends. The section that follows includes analysis of the global foodservice equipment market by product type, end use, and region. The three sections evaluate the global foodservice equipment market on the basis of various factors covering the present scenario and future prospectus. The report also provides region-wise data of local and international companies. The report is structured to facilitate the reader to develop a thorough understanding about the foodservice equipment market. It begins with market definitions, followed by the foodservice equipment market background, market dynamics and market analysis by key segments, regional analysis, and competition landscape. Each section covers a qualitative and quantitative assessment of the foodservice equipment market on the basis of facts, historical developments, and key opinions collected from industry participants through dedicated interviews and trends in the foodservice equipment market. The report begins with a market introduction, defining the foodservice equipment market taxonomy and product definitions regarding the global foodservice equipment market assessment. In the next section, the report describes the foodservice equipment market development background, covering macro-economic factors, industry factors, product life stage and associated stages, forecast factors, regional weighted average pricing analysis, value chain overview covering approximate margins, an indicative list of stakeholders involved in each stage, and an assessment of the installed base and replacement rate of foodservice equipment for the base year considered for the study. The next section of the report discusses market dynamics such as the drivers (supply and demand side), restraints, and trends impacting the foodservice equipment market growth on a global level. Market opportunities or potential for manufacturers have been presented in the subsequent section of the same chapter. This section also includes the impact assessment of the market dynamics on the global foodservice equipment market on a qualitative level based on facts and insights. Subsequent sections of the report provide value (US$ Mn) and volume (‘000 Units) projections for the foodservice equipment market on the basis of the aforementioned segments on a global level. The global market values represented in these section have been agglomerated by collecting data and information on a regional level. The foodservice equipment market information, along with key facts and insights, covers unique analysis frameworks such as absolute $ opportunity analysis, year-on-year growth trend comparison, market share, and attractiveness analysis for each of the sub-types covered in each segment. The next section of the report presents a summarised view of the global foodservice equipment market based on seven prominent regions considered in the study. The section includes regional market position, growth potential, trends, and market attractiveness analysis for each of these regions. The market analysis sections cover regional trends, weighted average pricing analysis, and market projections for each segment, including Y-o-Y growth trends, market share analysis, market attractiveness, and incremental $ opportunity assessment. These sections analyse the degree at which the global drivers are influencing this market in each region. All the above sections evaluate the present market scenario and growth prospects in the global foodservice equipment market, while the forecast presented in the sections assess the foodservice equipment market size in terms of volume and value. In order to offer an accurate forecast, we started by sizing the current market, which forms the basis of how the global foodservice equipment market is expected to develop in the future. Given the characteristics of the foodservice equipment market, we triangulated the outcome of three different types of analysis, based on primary research, secondary research, and our own analysis. However, forecasting the market in terms of various foodservice equipment segments and regions is more a matter of quantifying expectations and identifying opportunities rather than rationalising them after the completion of the forecast exercise. In addition, it is imperative to note that, in an ever-fluctuating global economy, we not only conduct forecasts in terms of CAGR, but also analyse the foodservice equipment market on the basis of key parameters, such as Year-on-Year (Y-o-Y) growth to understand the predictability of the foodservice equipment market, and identify the right opportunities available. As previously highlighted, the foodservice equipment market is split into a number of sub-segments. All the foodservice equipment sub-segments, in terms of product type and region, have been analysed on the basis of Basis Point Share (BPS) to understand each individual segment’s relative contribution to the growth of the foodservice equipment market. This detailed level of information is important for the identification of various key trends witnessed in the foodservice equipment market. Another key feature of this report is the analysis of all the key segments in the foodservice equipment market, sub-segments, and the regional adoption and revenue forecast in terms of absolute dollar opportunity. This is traditionally overlooked while forecasting the foodservice equipment market; however, absolute dollar opportunity is critical in assessing the level of opportunity that a provider can look to achieve, as well as to identify potential resources from a sales and delivery perspective in the foodservice equipment market. In order to understand the key market segments in terms of the growth and installation of foodservice equipment across the concerned regions, Future Market Insights has developed the foodservice equipment market attractiveness index, which will help providers identify real market opportunities. In the final section of the report, a competitive landscape of the foodservice equipment market is included to provide report audiences with a dashboard view categorized on the basis of providers present in the value chain, their presence in the foodservice equipment market, and key differentiating factors and strategies. The primary category of providers covered in the report includes foodservice equipment manufacturers. This section is primarily designed to provide clients with an objective and detailed comparative assessment of the key providers specific to a market segment in the value chain of the foodservice equipment market. Report audiences can gain segment-specific vendor insights to identify and evaluate key competitors on the basis of the in-depth assessment of their capabilities and success in the foodservice equipment marketplace. Detailed profiles of the providers are also included in the scope of the report to evaluate their long-term and short-term strategies, key offerings, and recent developments in the foodservice equipment market. Key competitors covered in the report include Electrolux, Libbey Inc., Tupperware Brands Corporation, Fujimak Corporation, Duke Manufacturing Co. Inc., Cambro Manufacturing Company, Inc., Vollrath Co., Hoshizaki Electric Co., Ltd., Dover Corporation, and Rational AG. However, the three most prominent players include Manitowoc Foodservice Inc, Middleby Corporation, and Ali S.p.A, Hobart Corporation.